Don't you think that some of the Apolitical RWA persons can be nominated as the Alderman ? OUR SAY : Everyone knows that RWA persons, are mostly apolitical, Social workers, without any political interference. They are working for the society since last many years and regularly raising various issues concerning the society. Under the DMC Act, aldermen do not have voting rights but are nominated from among social workers or experts in different fields. 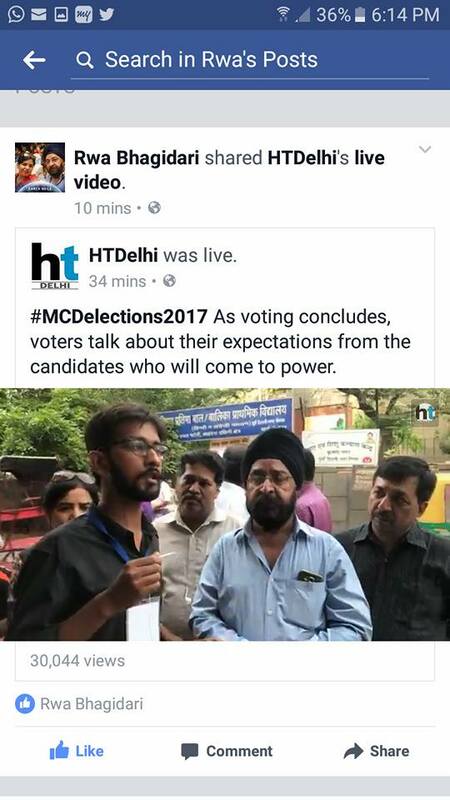 As 30 persons are to be nominated to the 3 MCD's of Delhi i.e. 10 persons to each MCD, even a few inductions of RWA persons may help in improving the situation. As they are absolutely apolitical, they can act as a bridge between two different political parties, at two different levels, in managing the affairs of the MCD. The RWA persons must be considered, as the Social Workers / Experts, without any political tagging. Labels: Don't you think that some of the Apolitical RWA persons can be nominated as the Alderman ? NEW DELHI: The recent Supreme Court order to shut down a mobile phone tower in Gwalior on a plea filed by a 42-year old domestic help has heated up the debate about the supposed harmful radiations emitted by them. The petition had claimed that radiation from the illegal tower installed on a neighbour's rooftop in 2002 had affected him adversely in the past 14 years. The SC order has given a shot in the arm to the campaigns of many Residents' Welfare Associations (RWAs) in Delhi who have been opposing these structures for years. Dr Kapil Kakkar, RWA president of Jangpura Extension, said that he has filed several complaints with the municipal corporation about installation of mobile phone towers in residential areas. Many residents have now asked him to take up the issue strongly, especially after the SC verdict. "A guesthouse in our area has a mobile tower for the past 15 years. Residents living nearby are suffering from cancer because of it. 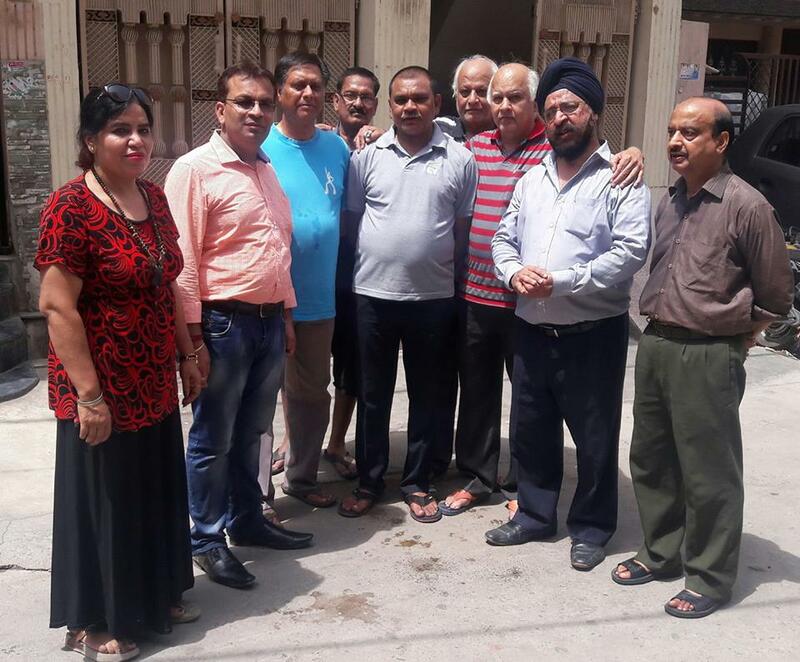 Even the guesthouse owner and his mother are suffering from the ailment, but he is unable to remove the tower as the clauses in the agreement cannot be violated," said Kakkar. The East Delhi RWA president, BS Vohra, took the campaign against mobile towers a step further by checking the radiation emanating from them. "But the companies reduced the frequency that day and we couldn't get a clear reading," he claimed. Requesting the government to act strongly, Vohra said that mobile companies "have a strong lobby and they get away despite knowing that radiation from these towers could be harmful." With thanks : TOI : LINK : for detailed news. सुक्मा - आख़िर कब तक सब कुछ यूँ ही चलता रहेगा ? आख़िर कब तक सब कुछ यूँ ही चलता रहेगा ? 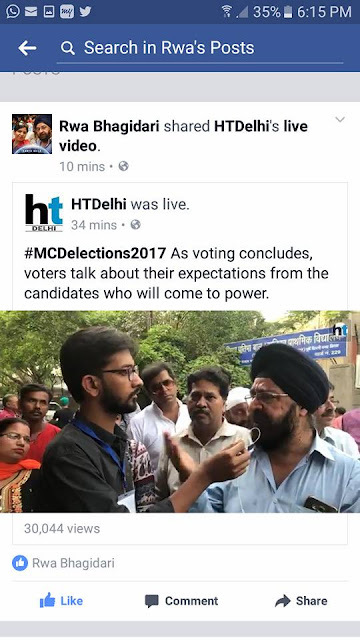 कब तक हमारे जवान, इसी तरह से शहीद होते रहेंगे ? कब तक हम उनको शरधांजलि देते रहेंगे, नमन करते रहेंगे, पुष्प चढ़ते रहेंगे या फिर कॅंडल मार्च निकाल कर अपना दायितव पूरा करते रहेंगे ? क्या आपको नही लगता कि जो भी हो रहा है, ग़ल्त हो रहा है ? आख़िर कौन हैं वो लोग जो अपने ही देश के जाँबाज सिपाहियों पर हमला करके, उनकी निर्दयता से हत्या कर देते हैं ? क्या आपको नही लगता कि वो लोग इस देश के दुश्मन हैं ? और अगर वो इस देश के दुश्मन हैं, तो वो लोग इस देश मे क्या कर रहे हैं ? क्यों हमारी सरकारें उन लोगों को कंट्रोल करने मे विफल रहती हैं ? 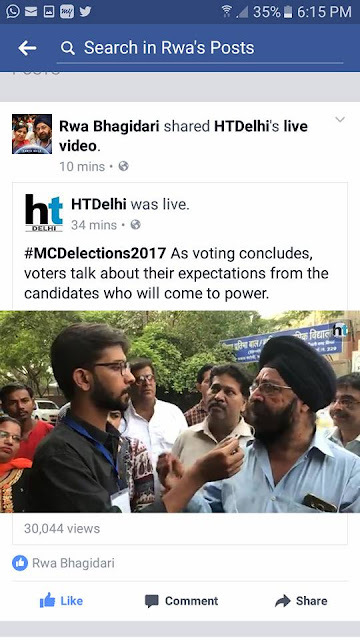 आज जो कुछ सुक्मा मे हो रहा है, वो ही सब कुछ कश्मीर मे भी हो रहा है. 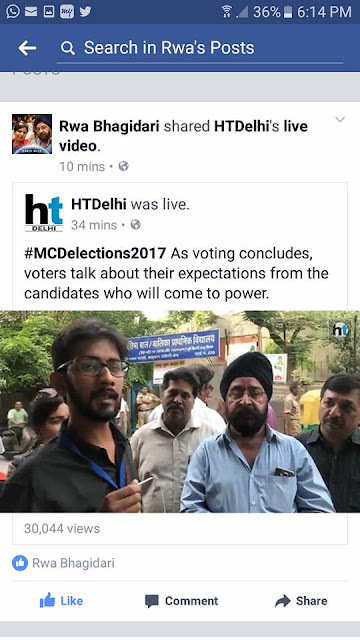 कश्मीर मे भी हमारे जवानो के साथ दुर्व्यवहार हो रहा है. बचों और महिलाओं की आड़ मे कहीं उन पर पत्थर बरसाए जाते है और कहीं उनको गोलियों से भून दिया जाता है. क्या आपको नही लगता कि बस, अब और नही, इस बात का अब अंत होना चाहिए, अब किसी और घर का चिराग, इस तरह नही खोना चाहिए. अब अगर किसी को मरना है तो वो लोग मरने चाहिए, जो अपने ही देश के सिपाहियों पर हमला करते हैं. Vote Delhi Vote - Door to door campaign by RWAs - requesting public to come out and vote - Any party Any candidate, Must come out and Cast your Vote. The campaign will be continued tomorrow. My inner heart prompts and impels and compels me to richly compliment and heartily congratulate you and your relentless efforts to bring the RWAs to the forefront have at last partially borne fruit and we wish and hope that the parties, whichever win and come to power, remember their assurances given in their respective manifestos and don't throw away them and act according to their whims and fancies and arbitrarily and arrogantly obliging their own 'chamchas' who had helped them in their campaign! We had been seeing this disgusting sight in the past and we wish they don't follow the tradition in this sphere and change drastically their attitude and become receptive and responsible with humility and respect to elders etc. You are aware that the local MLA or the MP cannot easily be met and express our grievances and they don't act upon them and resolve them. This is the state of affairs, pardon me to say so, which I speak from experience! Like we go often to temple, Gurdwara or Church and Mosque to pray, we have to worship, prostrate and beg before them to ventilate our grievances! It is unfortunate but we are helpless!! I wonder when the time will come that they listen to our grievances and resolve them on a time bound basis and reply to us also! They have to become e-savy too, as all facilities are provided to them. You would wonder that all the e-mails sent to our local Councillor had not been seen and attended too, as he was not conversant with the same but only personal visit alone with a begging bowl will be attended to and that too on unjustified basis! We wish you all luck in your sincere and ceaseless efforts in upholding the pivotal role being played by the RWAs who know better the difficulties and grievances better and they could present them more effectively and efficiently rather than depending on hear-say of individuals etc. Of course, in RWAs too, there are some vested interested persons who have been holding offices time immemorial and they don't have a long term vision for improvement of the colonies but short term goals and effort to get immediate panacea instead of resolving the problems on a long term basis which will benefit one and all. The newly elected MCD Councillors have to pay immediate attention to cleanliness of the colonies, maintaining parks and regulating parking of vehicles and demolish all encroachments on roads etc. making a safe path for pedestrians and find ways and means to remove congestin on roads, which mainly pollute the air and affect the health and wealth(?) of people. The usage of water and power will increase manifold with the scorching summer is on in all furies and regulate them judiciously so that everyone gets an equitable share of these two precious things. We may have to sacrifice, if necessary, our luxuries to ensure that all people live comfortably and happily and healthily which will bring about immense pleasure 'anand hi anand' in their lives! With deep regards and once again we congratulate you on your herculean efforts being made in all directions to make EAST DELHI THE BEST in all respects, where 1/3 of the population live, bordering the biggest state UP!! In a bold move to counter anti-incumbency in the forthcoming MCD Elections, BJP DEMONETISED all its sitting Councillors.Whatever the reasons for the BJP Top Brass in pinning the blame for MCD’s dismal performance on sitting Councillors, the much need introspection has flawed in diagnosing the REAL MALADY. On the other hand AAP has chosen to waive of Property Tax, simultaneously claiming that they will pull MCD out of Financial Mess within a year. Little realising that Delhi requires huge investment in automation and for infrastructure that has decayed over time. Congress has in the past experimented to make MCD more efficient that have come to naught ...... Doubling of Councillors and Trifurcation of MCD ...... were experiments carried out more to achieve POLITICAL STRANGLEHOLD RATHER THAN TO ACHIEVE EFFICIENCY. THE NETA’S ARE READING IT WRONG, the real solution lies in the restructuring of MCD’s Multiple Authorities and making officials more accountable for the delivery of services. The Commissioner’s and their Deputies sit in plush offices with little or no connect with the public or grassroot understanding of the area under them. They depute an army of JE’s, AE’s, ZE’s etc for field inspections with Area Representatives, what happens thereafter remains a mystery. GK residents would remember how the Commissioner stood up MP Meenakshi Lekhi on the vexatious Barat Ghar issue and how hemanipulated the AAP/BJP turf war to avoid appearing before the Delhi Vidhan Sabha. What chance does the poor Councillor or the Hapless Citizen has. The Councillors too must take the blame but the ‘Powers That Be’ of the three Principal Parties by their actions have shown little understanding of how MCD operates or what truly ails it, thereby dashing any hope of streamlining MCD operations. BJP, Congress and AAP are in a constant blame-game accusing each other for the mess in MCD, giving officials the perfect escape route for their abysmal performance and corruption. There was a time when the Centre, State and MCD had a single party or ruling in State and MCD ...... DID MCD PERFORM ANY BETTER OR WAS IT ANY LESS CORRUPT ????? Multiplicity of Authority between the Centre, State, Municipality on the one hand and the Maze of Departments with overlapping responsibilities provide an ideal foil for the Babu’s, to shift the entire blame of non performance and corruption to the Political Class who play into their hands ....... AS HAS HAPPENED NOW WITH THE DEMOITISED COUNCILLORS .... the Solution lies elsewhere, THINK. AAP manifesto : No Res. House Tax, No Convergence charges, No Parking charges, Works & payments to contractors after approval from RWAs, water logging to be controlled from first year onwards, sanitation landfill sites to be closed, etc.etc. Congress manifesto : pledges Empowerment of RWAs. BJP manifesto : confirms a monthly meet with RWAs on various civic issues. SEEMS OUR EFFORTS ARE YIELDING RESULTS. ALL THE THREE POLITICAL PARTIES HAVE TRIED TO DESCRIBE THE ROLE OF RWAs IN THEIR OWN WAY. Congress manifesto pledges Empowerment of RWAs. BJP manifesto confirms a monthly meet with RWAs on various civic issues. Lets see what comes out of the AAP manifesto tomorrow. We are regularly raising the issue at various platforms since a long time & hopefully seems that the time of yielding results is nearing. Looking forward for your valued support. The Congress’ manifesto on urban infrastructure for the MCD polls, released today, promises empowerment of resident welfare associations (RWAs) and time-bound delivery of 13 civic services. Highlights of the manifesto include dedicated fund for Chatth Puja arrangements, Bhagidari scheme revival for participatory governance, simplification of building by-laws, ensuring women’s security by installing LED lights and house tax exemption for self-occupied properties and senior citizens above 65 years. Releasing the manifesto, Delhi Congress president Ajay Maken accused both the BJP and the AAP of making “false promises” to people on tax issues. “Kejriwal says house tax will be waived after the AAP’s victory in MCD polls. Perhaps, he does not know or is just making false promise because house tax can not be waived totally, although exemption in some categories is allowed,” he said. The Bhagidari scheme to promote broad-based civic participation in local governance, launched by the Congress when it was in power in Delhi, but “neglected” by the BJP-ruled civic bodies, will be revived and more importance would be given to the RWAs in civic matters, Maken said. If the Congress wins the civic bodies election, the scheme will be implemented in a big way by engaging elected RWAs in parking arrangements in residential colonies, the Delhi Congress chief said. The right of citizens for time-bound delivery of services will be boosted by issuing a charter of 13 civic services, within three days of assuming office in the corporations after the polls, he said. 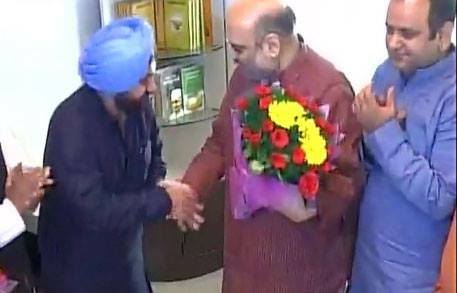 Delhi Congress stalwart Arvinder Singh Lovely joined BJP. He said that he was being ignored since last two years while he was willing to serve the city. He was not included in the various committees formed by Ajay Maken. Even though he is an automatic member of the manifesto committee, as he was Ex President of the Delhi Pardesh Congres committee, he was not invited while declaring the manifesto. 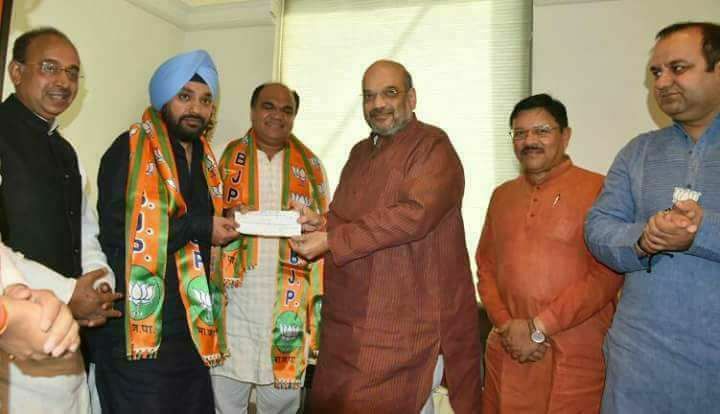 While joining BJP, he showed faith in the Leadership of Modi ji & Amit Shah. 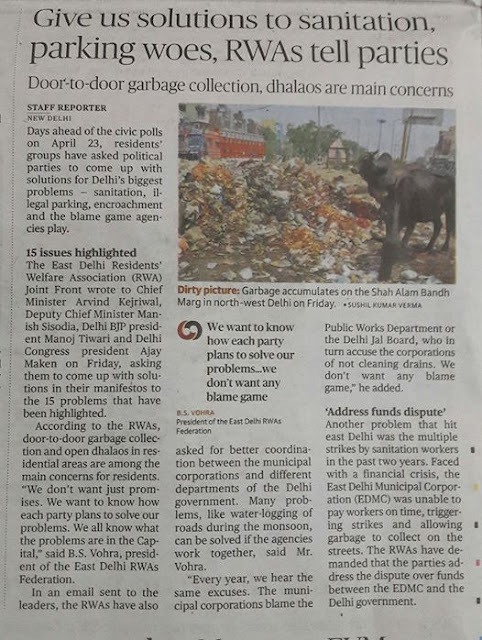 Days ahead of the civic polls on April 23, residents’ groups have asked political parties to come up with solutions for Delhi’s biggest problems — sanitation, illegal parking, encroachment and the blame game agencies play. 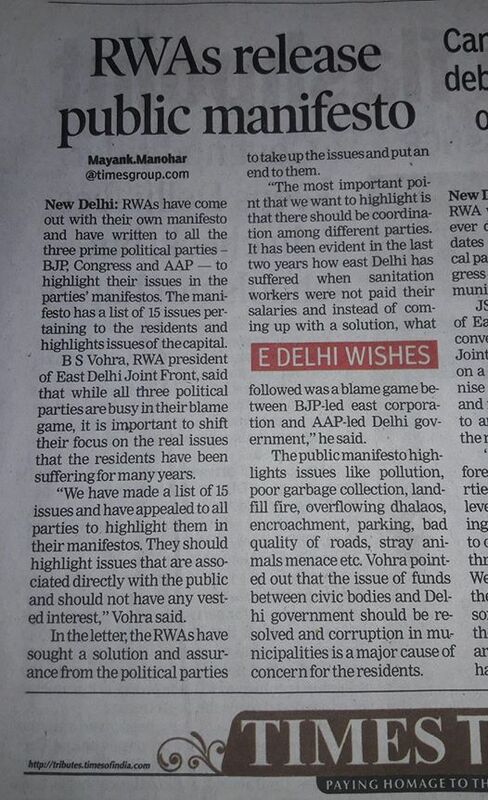 The East Delhi Residents’ Welfare Association (RWA) Joint Front wrote to Chief Minister Arvind Kejriwal, Deputy Chief Minister Manish Sisodia, Delhi BJP president Manoj Tiwari and Delhi Congress president Ajay Maken on Friday, asking them to come up with solutions in their manifestos to the 15 problems that have been highlighted. According to the RWAs, door-to-door garbage collection and open dhalaos in residential areas are among the main concerns for residents. “We don’t want just promises. We want to know how each party plans to solve our problems. We all know what the problems are in the Capital,” said B.S. Vohra, president of the East Delhi RWAs Federation. 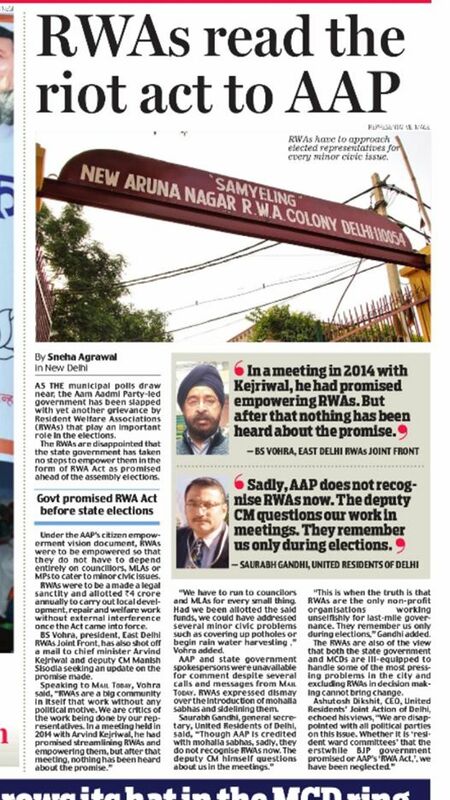 In an email sent to the leaders, the RWAs have also asked for better coordination between the municipal corporations and different departments of the Delhi government. Many problems, like water-logging of roads during the monsoon, can be solved if the agencies work together, said Mr. Vohra. “Every year, we hear the same excuses. The municipal corporations blame the Public Works Department or the Delhi Jal Board, who in turn accuse the corporations of not cleaning drains. We don’t want any blame game,” he added. 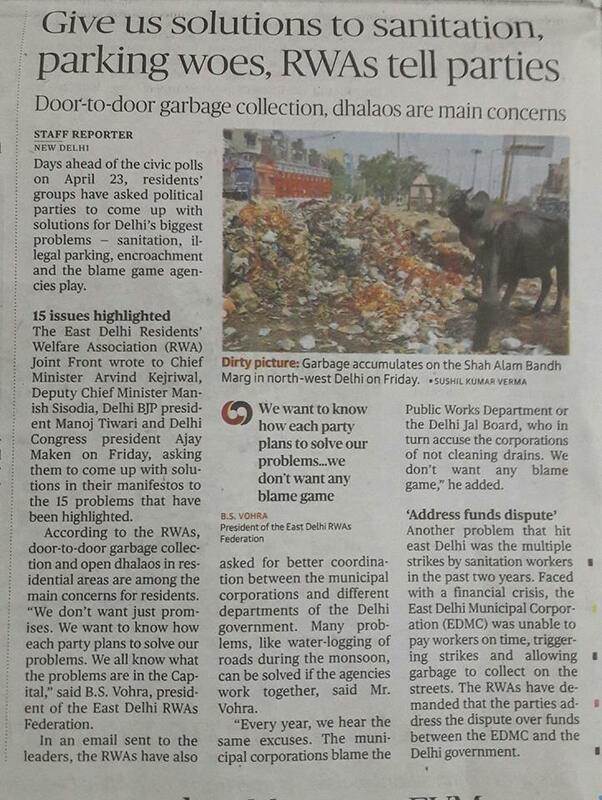 Another problem that hit east Delhi was the multiple strikes by sanitation workers in the past two years. Faced with a financial crisis, the East Delhi Municipal Corporation (EDMC) was unable to pay workers on time, triggering strikes and allowing garbage to collect on the streets. The RWAs have demanded that the parties address the dispute over funds between the EDMC and the Delhi government. RWAs have come out with their own manifesto and have written to all the three prime political parties ­ BJP , Congress and AAP -to highlight their issues in the parties' manifestos. The manifesto has a list of 15 issues pertaining to the residents and highlights issues of the capital.B S Vohra, RWA president of East Delhi Joint Front, said that while all three political parties are busy in their blame game, it is important to shift their focus on the real issues that the residents have been suffering for many years. “We have made a list of 15 issues and have appealed to all parties to highlight them in their manifestos. They should highlight issues that are associated directly with the public and should not have any vested interest,“ Vohra said. In the letter, the RWAs have sought a solution and assurance from the political parties to take up the issues and put an end to them. “The most important point that we want to highlight is that there should be coordination among different parties.It has been evident in the last two years how east Delhi has suffered when sanitation workers were not paid their salaries and instead of coming up with a solution, what followed was a blame game between BJP-led east corporation and AAP-led Delhi government,“ he said. The public manifesto highlights issues like pollution, poor garbage collection, landfill fire, overflowing dhalaos, encroachment, parking, bad quality of roads, stray animals menace etc. Vohra pointed out that the issue of funds between civic bodies and Delhi government should be resolved and corruption in municipalities is a major cause of concern for the residents. In spite of being the residents of the National capital, Delhiites are facing so many problems, such as : Pollution, Traffic jam, Parking, Encroachment, Water logging, Sanitation, Open Dhalav, Potholes, etc. 1. Most Polluted City : It has become, one of the most polluted city of the world. 2. Smoking mountains, Landfill sites : These are contributing to the Air, Water & Soil pollution. 3. Open Dhalav’s in the inner localities : They have become a big nuisance for the residents. 4. Door to Door Garbage collection : It is the very basic need of the hour. 5. Encroachment : It can be seen in any locality with bare eyes, and adds to traffic jam & pollution. 6. Traffic Jam : It has become a common problem for every locality. 7. Illegal parking : It is also the reason of Traffic jams as well as quarrels at various locations. 8. Potholes : These are visible on every single road in the inner localities. 9. Water Logging : The city is converted into a big lake, during every downpour in Monsoon. 10. Sanitation workers strike : Five strikes in two years have truly shattered the residents. 11. Stray Animals : Stray Dogs & Monkeys can be seen in every locality. 12. Funds problem between MCD & Delhi Govt. : It has caused severe damage to the local infrastructure. 13. MCD Corruption : It is the major cause of concern for the residents. 14. Co-ordination : In the Elections at Delhi Govt & MCD levels, any party may win. We are expecting a suitable coordination amongst all those who win and the Hon’ble LG, for suitable implementation of plans for the development of the city. 15. RWA EMPOWERMENT : Last but not the least, we expect the RWA Empowerment as RWAs are the selfless workers & a real backbone of the city. These are some of the very basic issues that require your immediate attention. We don’t think that any of the above issues require any further detailed description from our side, as all these issues are clearly visible with bare eyes, in almost every locality. We are now looking for your upcoming manifesto, with a GREAT HOPE. 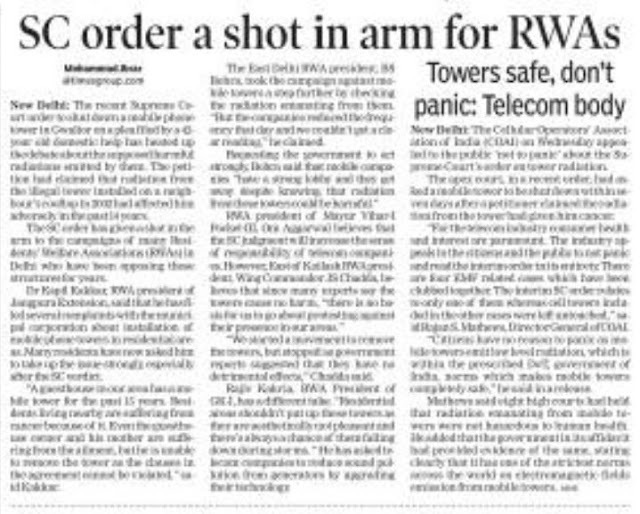 Supreme Court order to shut down a mobile phone tower in Gwalior on a plea filed by a 42-year old domestic help has heated up the debate about the supposed harmful radiations emitted by them. The petition had claimed that radiation from the illegal tower installed on a neighbour's rooftop in 2002 had affected him adversely in the past 14 years. A guesthouse in our area has a mobile tower for the past 15 years. Residents living nearby are suffering from cancer because of it. Even the guesthouse owner and his mother are suffering from the ailment, but he is unable to remove the tower as the clauses in the agreement cannot be violated," said Kakkar. Requesting the government to act strongly, Vohra said that mobile companies "have a strong lobby and they get away despite knowing that radiation from these towers could be harmful. RWA president of Mayur Vihar-I Pocket-III, Om Aggarwal believes that the SC judgment will increase the sense of responsibility of telecom companies. 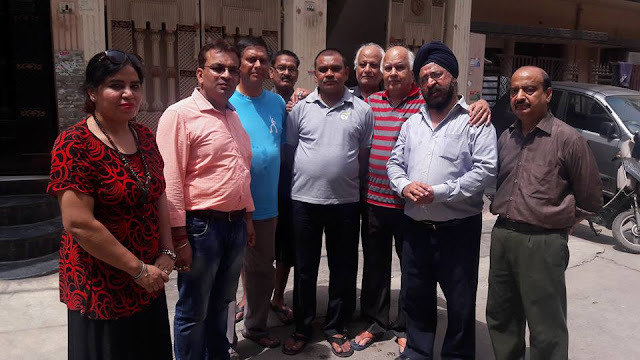 However, East of Kailash RWA president, Wing Commander JS Chadda, believes that since many experts say the towers cause no harm, "there is no basis for us to go about protesting against their presence in our areas. We started a movement to remove the towers, but stopped as government reports suggested that they have no detrimental effects," Chadda said. Rajiv Kakria, RWA President of GK-I, has a different take. "Residential areas shouldn't put up these towers as they are aesthetically not pleasant and there's always a chance of them falling down during storms. " He has asked telecom companies to reduce sound pollution from generators by upgrading their technology. Timely exposure to what effect ! Mail Today : RWAs Empowerment Vision Plan ?